Property Location Located in Onalaska, LaCrosse Stoney Creek is close to Valley View Mall and Riverside Amusement Park. 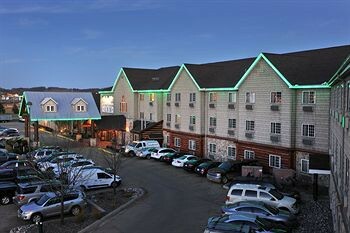 This hotel is within the vicinity of Onalaska Omni Center and Myrick Park.Rooms Make yourself at home in one of the 157 air-conditioned guestrooms. Complimentary wired and wireless Internet access is available. Private bathrooms with shower/tub combinations feature complimentary toiletries and hair dryers. Conveniences include desks and complimentary newspapers, and housekeeping is provided daily.Rec, Spa, Premium Amenities Be sure to enjoy recreational amenities, including an outdoor pool, an indoor pool, and a spa tub. This hotel also features complimentary wireless Internet access, an arcade/game room, and gift shops/newsstands.Dining Enjoy a satisfying meal at a restaurant serving guests of LaCrosse Stoney Creek. Quench your thirst with your favorite drink at a bar/lounge.Business, Other Amenities Featured amenities include a 24-hour business center, complimentary newspapers in the lobby, and dry cleaning/laundry services. Planning an event in Onalaska? This hotel has 648 square feet (58 square meters) of space consisting of a conference center, conference space, and meeting rooms. A roundtrip airport shuttle is complimentary during limited hours.